Hollywood star Will Smith showed some bhangra moves as he spoke about having a Bollywood dance sequence on his bucket list, while also opening up on his childhood, struggle as an artiste, dealing with failure and setting the goal for himself to be the best movie star in the world. 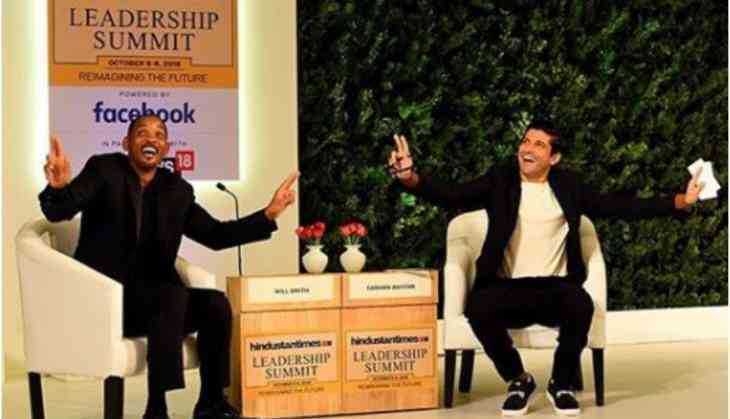 Smith, an Academy Award nominee and Grammy Award winner who has had a diverse career across films, television and records, was in conversation with Bollywood actor-singer-filmmaker Farhan Akhtar at the 16th Hindustan Times Leadership Summit here on Saturday. Farhan taught Smith some bhangra moves, which the "Independence Day" actor proudly showed off to the audience at the summit. "One of the things on my bucket list is to be on a Bollywood dance sequence," he said as he recounted meeting former Miss World Aishwarya Rai Bachchan 15 years ago and their conversation about doing something together. "But it never happened. Perhaps I would do a film with her," added Smith, who finds the contrast in India "beautiful". "On any street corner you could cross a thousand years. There could be someone on a brand new cellphone and someone on a cart. The intermingling of the ages and the lifestyle is amazing." On the big screen, Smith has regaled cine-goers with movies like "Hitch", "I am Legend", "I, Robot", and "Men in Black I, II, & III". He even featured in the recent Netflix film "Bright". Music is what first set the pace for Smith's career in showbiz. "Pop music started in the US in late 70s. I was 12 years old when I took to rap music. First time I heard rap, I knew I had to do it. I had to do it because I knew my parents won't like it," Smith said. He said at one point in his life, he had decided he never wanted to be broke again and set himself a goal to be the best movie star in the world. "After having got a second shot I knew I never wanted to be broke again. I preferred the space of being successful and responsible. I became disciplined. I said to myself I wanted to become the biggest movie star in the world. "I wanted to have big giant hit movies that people saw all over the world. So we looked at the top 10 films and tried to find a pattern. We realised they were all special effects movies," said the 50-year-old. Apart from those, he has worked on three biopics -- "Ali", "The Pursuit of Happyness" and "Concussion". Sharing the experience, he said: "Three biopics that I have done was with living people. I have had the opportunity to sit with the person, talk to them and meet their family. "I wanted them and the family to love the movie. I was sitting behind (boxer) Muhammad Ali when he was watching 'Ali' for the first time. For an hour, he didn't move and I thought he hates it. "There is a scene where I was screaming and he turned to his wife and said, 'Was I that crazy' and he turned to me and said, 'Man you've done a great job'." For Smith, playing Muhammad Ali was a life-changing experience in his career. The actor said people need to learn the importance of embracing failure. "A lot of people have a wrong perspective on failure. You fail, you correct and then you win. I've been lucky enough to embrace failure, I started to develop an ability to get over and embrace the lesson. You learn more from your failures than your successes." As for his childhood, he said it "wasn't as good as I wanted it to be". "There was violence as I grew up. So I wanted certain things for my kids. What the family, me and my wife have created is the coming together of a 40-year-old dream. I always wanted to get married and have a happy family," added the father of three.